I work in the field of hospitality for 19 years, I took the position of Maitre D’Hotel walk to where there have bound relationship with Sommelier, I worked in various large hotel chains. Sommelier should be one serious person with charisma, to have capacity geography, can learn and memorize a lot about wine and always invest in it through various courses and visits to wineries. As advice for new Commis sommelier, is to spend as much time near very professional Sommeliers and desire to learn something new. 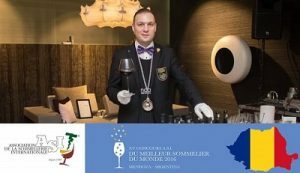 Sommelier is orderly person, can have the ability to perceive wine not only by brand, namely what happens inside the bottle, and that person not only promotes expensive wines. I think the key ingredient to produce a list of wines is you know the customer’s requirements, and une class you can. I my new job I prepare my own signature wine list, unique wines, varieties not found very often in restaurants but also with great wine houses. At the moment I work in the THE VINE RESTAURANT U.K in Sevenoaks near LONDON, my list includes different varieties and countries like INDIA, CROATIA, GEORGIA, SERBIA,BULGARIA. Chardonnay variety is my favorite, I love the complexity and variety.